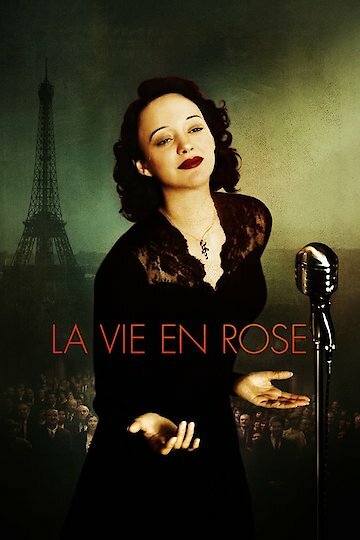 "The Extraordinary Story of Edith Piaf"
La Vie en rose is a biographical movie about French singer Edith Piaf. Co-written and directed by Olivier Dahan, the film was written by Isabelle Sobelman and Olivier Dahan, who also directed the film. Starring Marion Cotillard, the film also features Pascal Greggory, Sylvie Testud and Gérard Depardieu. The movie begins in 1918 in Paris when Edith is a small child. She is crying on the stairs after she is teased by children in the streets. Her mother is singing and begging for change across the street. Then she writes to Edith’s father, an acrobat, who is in World War I fighting in a battlefield. She lets him know that she will be leaving Edith with her mother in order to pursue life as an artist. When her father returns, he takes a sickly Edith to live with his mother, a bordello madam. Edith is now surrounded by prostitution but taken under the wings of the women there. Though she is cared for, she becomes blind until the age of 7. Her father returns years later and takes Edith on the road as he works in the circus. While cleaning up after dinner, Edith sees the apparition of St. Therese in flames, assured that she will always be protected. When Edith turns nine, her father, after an argument, leaves the circus and performs on the streets of Paris. Edith holds a hat for coins during his lackluster performances. When a passerby asks if she is in the show, she begins to sing "La Marseillaise" and manages to move the crowd with her raw emotion. La Vie en Rose is currently available to watch and stream, buy on demand at Amazon, Vudu, Google Play, FandangoNow, iTunes, YouTube VOD online.